Employee safety is perhaps the greatest responsibility an organization has. A large records management company knew that nobody planned to be unsafe, but a lack of job engagement often meant failure to follow procedure. PDG helped create a program that focused on overall employee engagement and commitment. PDG integrated experiential learning with coaching and performance support to change behavior. 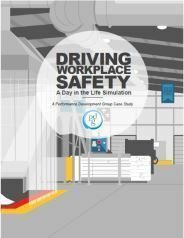 PDG created multiple simulations that reflected a day in the life of employees in targeted departments, providing engaging, immersive experiences that provided them with on-the-job scenarios, opportunities to make decisions, and view the consequences of their decisions.